Introducing … our new monthly food series here on FBC called One Curious Ingredient by Michelle Peters-Jones. These articles explore the history and culinary use of an ingredient or dish that's unfamiliar to her, and probably many of us! We also invite you to share your own stories and recipe links in the comments. First up is fragrant and spicy harissa. They say curiosity killed the cat – they have obviously not met mine, who is well past his ninth life. Having grown up with very little exposure to world food, except for the infamous Indian-Chinese food, one of the first things I did when I moved to London as a graduate student was to try a new restaurant and a new cuisine almost as often as I could afford it. While growing up in India encouraged my love of traditional food and cooking, it was London that expanded my horizons and introduced me to ingredients, techniques and cultures that have made me the cook and writer I am. In this column, One Curious Ingredient, join me on my journeys as I explore and trace the history and culinary use of an ingredient or dish that is unfamiliar to me. Of course, if you are from the culture that this ingredient is from, you might already be familiar with it, in which case I’d love your own stories and recipe links in the comments. One of the first restaurants I tried in London was a North African one, where I was introduced to harissa for the first time. Harissa is a fragrant, spicy chili paste or sauce that is one of the primary ingredients in Tunisian, Libyan, Algerian and more recently, Moroccan and Middle Eastern cuisine. Different parts of North Africa have differing ingredients, but the basic paste or sauce is made of hot red chili peppers blended with aromatics like garlic and sweet roasted red peppers, sun dried tomatoes and smoky spices like cumin, caraway and coriander. Chiles were not native to Europe and Africa and it was not until the Spanish and Portuguese colonized South America and Mexico that chilies were introduced to these cuisines, and to other colonies like India and in Southeast Asia. From there, chili peppers became the staple in many of these cuisines, making for a hotter version of Spanish and Portuguese inspired dishes. Harissa is one of those preparations that is used both as a cooking ingredient, as well as a condiment to be added to dishes to taste, similar in some ways to Sriracha. Traditionally it is used as an ingredient in Tunisian cooking, while Moroccan cooking uses it as a condiment on the table. The uses for this sauce are endless. Brush it over roast chicken for a spicy kick, or use it as a rub for meats, fish and vegetables. Stir it into dips like hummus, baba ghanouj and carrot salad. Add a teaspoon to couscous. Mix some harissa with a little extra oil, and brush on chicken wings. This is my recipe for harissa and I love the spicy, warm, nuanced notes in this delicious sauce. I had a large bag of fresh hot chili peppers that I bought for a bargain at the farmers' market, so that’s what I normally use in this recipe. You can, however, use all milder dried red chilies and Mexican chilies like guajillo or papilla. You will need to seed and rehydrate dried chilies in warm water before using them, as it makes them easier to blend. Harissa will keep in your fridge for a couple of weeks, covered with a thin layer of oil. Preheat oven to 400F. Slice the cheeks of the red pepper, and place in a single layer on a baking tray. Roast for 30 minutes, turning once, then skin and keep aside. While the pepper is roasting, stem and seed the dried pasilla and chipotle chilies, and place in a bowl. Cover with hot water and soak for 30 minutes. Once soaked, drain and reserve the soaking water. Stem and slice the fresh hot peppers into halves. Discard the seeds, then place the chilies in a blender or food processor. Heat a heavy-duty pan over a medium high heat. Toast the cumin and caraway seeds for about 30 seconds, until fragrant. Take off the heat, let cool and grind to a fine powder in a spice blender or an old coffee grinder. Add the roasted sweet pepper, soaked dried chilies, the ground cumin and caraway seeds, garlic, tomato paste, red wine vinegar and the olive oil to the food processor or blender, and blend to a fine paste, using the reserved soaking water, if required, to loosen the sauce. Season to taste with salt and extra red wine vinegar, if needed. Store in an airtight jar, covered with a thin film of olive oil. Use your harissa in some of these dishes below, or post your own recipe link in the comments section. Moroccan Spiced Carrot and Coriander Soup from Michelle Peters-Jones at [The Tiffin Box](http://www.thetiffinbox.ca/2014/10/moroccan-spiced-carrot-and-coriander-cilantro-soup.html). Middle Eastern Roast Chicken With Toum from Karen at [Kravings](http://k--ravings.blogspot.ca/2015/05/middle-eastern-roast-chicken-with-toum.html). Harissa Chicken, Potatoes and Veg from Samantha at [My Kitchen Love](http://www.mykitchenlove.com/harissa-chicken-potatoes-and-veg/). 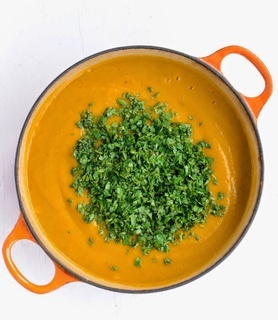 Roasted Carrot and Lentil Soup with Harissa and Mint from Janet at [The Taste Space](https://tastespace.wordpress.com/2011/07/10/roasted-carrot-and-lentil-soup-with-harissa-and-mint/). Lentils with Chorizo, Harissa and Shrimp from Bernice at [Dish 'n The Kitchen](http://Lentils with Chorizo, Harissa and Shrimp). Harissa is a staple in our pantry. The powder is ready for everything, from a sprinkle on eggs or added to quinoa or Buckwheat risotto. Our fav is a Moroccan Tomato soup (recipe on my blog) I do have a jar of the paste in the fridge as well. Now I’ll have to try making my own paste. Thanks for the recipe!